The perfect place to reconnect with nature. If you've been anywhere near Pinterest in the last few years, you've no doubt stumbled on pictures of Arkansas' Thorncrown Chapel in Eureka Springs; it is, admittedly, utterly breathtaking, but it's not the only glass chapel hidden in the forests of Arkansas; in fact, it's only one of three! All were designed by famed architect E. Fay Jones, a native of Arkansas. This is your guide to the stunning glass chapels of Arkansas...plus a couple bonus glass chapels you'll find across America. It should come as no surprise that Jones was an apprentice to Frank Lloyd Wright-- they both employ a style that not only draws inspiration from nature but blends seamlessly into natural surroundings. But while the two were close friends, Jones preferred the quiet comfort of the Ozark forests to traveling around the country. It makes sense, then, that his most famous buildings were inspired by and were built within those forests that he loved so much. Thorncrown was the first of the three-- it was commissioned by a retired schoolteacher and was built in 1980. The wooden chapel looks like it's open-air, but it's actually made of glass. In fact, nothing on the chapel was bigger than anything that could be carried by two men; this cut down on transportation costs and allowed it to be built in a more secluded area. The reaction to Thorncrown Chapel was immediate: people were enchanted by the serene space. In fact, it was added to the National Register of Historic Places in 2000--- a rare occurrence, since almost everything added to the list is over 50 years old. The next glass church was the Mildred B. Cooper Memorial Chapel. It's in Bella Vista, not far from Eureka Springs, where Thorncrown is located. 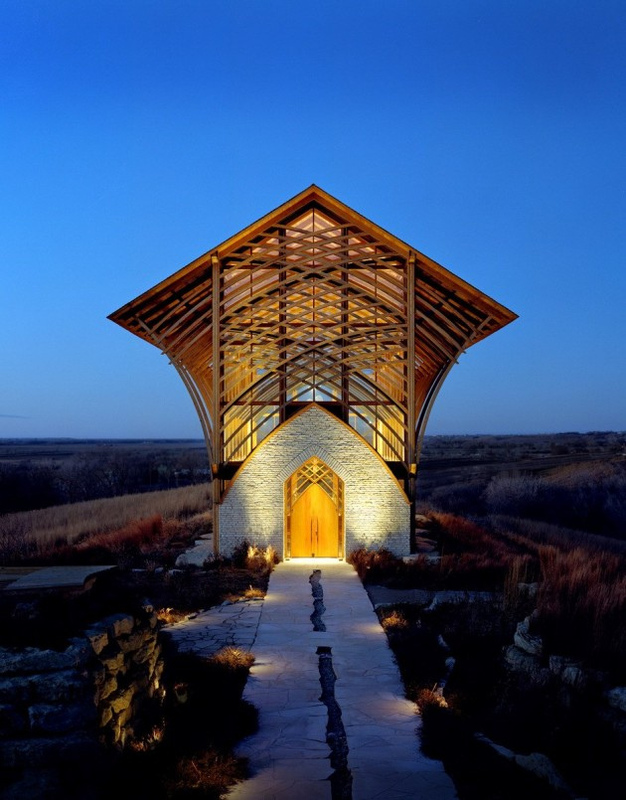 This chapel differs slightly in design: it's entirely steel and glass and it features dramatic, swooping Gothic arches instead of the straight lines of Thorncrown's open-beam bracing system. Both are free and open for quiet meditation, and on the four days leading up to Christmas, the Cooper Memorial Chapel is lit up until 8pm-- and if you thought it was pretty during the day, wait until you see it glowing at night! The last chapel, Anthony Chapel was built mostly by Jones's partner, Maurice Jennings. It's the biggest of the three-- it's an incredible 6 stories tall and can seat 160 enraptured guests. It's less rustic than the other two, since it's located within Garvan Woodland Gardens at the University of Arkansas, so it's especially perfect for weddings and other events. The location within the manicured gardens is simply gorgeous, with waterfalls, bridges, overlooks, and more. Then again, you really can't go wrong with any of the glass chapels... they're all awe-inspiring in the own ways! Since we're talking about gorgeous glass chapels inspired by FLW, we might as well mention this gem, tucked away in a redwood forest on the side of a cliff in Rancho Palos Verdes. Designed by Lloyd Wright, son of Frank, its liberal use of glass, modern design, and location right on the cliffs above the Pacific Ocean, all make it the most perfect chapel in the country. Even the name, the Wayfarers Chapel, has a certain wistful charm to it. It's a textbook example of organic architecture, which is inspired by and blends in with the natural surroundings of the building-- you can see that the trees, painstakingly planned and planted around the chapel, appear to form living walls and roofs when viewed through the glass. BONUS 2: Holy Family Shrine in Gretna, Nebraska might not be surrounded by lush woodland, like the Arkansas chapels. And it's not on an ocean cliff, but it is one of the most beautiful modern churches in America. A priest had a vision in the early 1990s, and four men came together to build the chapel for travelers. Construction began in 1997, and today it stands as a stunning example of modern divine architecture. You can pray in it while seeing the valley and nature surrounding you. The shrine is nondenominational and everyone is welcome.